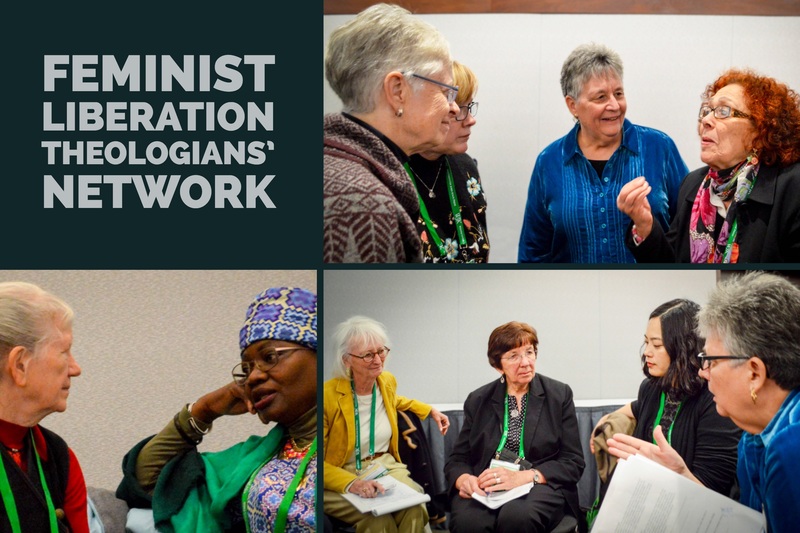 The Feminist Liberation Theologians’ Network (FLTN) is a project of WATER, encompassing colleagues from all over the world. It emerged from the necessity to link U.S. and Canadian feminist scholars, ministers, and activists in ways that would go beyond denomination, tradition, academic affiliation, and/or racial/ethnic boundaries. The FLTN is made up of people who affirm each other as engaged in feminist liberation theological work, whether academic or activist or both. The group engages in conversation and common work, and interfaces with similar groups around the world. The FLTN meets at the Annual Meeting of the American Academy of Religion for discussion and networking. Click here for a full report of the FLTN 2018 meeting. Click here for a full report of the FLTN 2017 meeting. Click here for a full report of the FLTN 2016 meeting. You can view a video recording of the session here. Click here for a full report of the FLTN 2015 meeting. If you wish to receive periodic updates from the FLTN, join the Google Group by clicking here, or contact Mary E. Hunt at mhunt@hers.com. If you are already on the list, please post to it so that we can keep one another informed about our work. Groups are also linked via the FLTN Network of Networks. The Women’s Alliance for Theology, Ethics and Ritual (WATER) is a feminist educational center founded in 1983 which responds to the need for theological, ethical, and liturgical development for and by women. We are an international community of justice-seeking people who promote the use of feminist values to make religious and social change. We invite you to partner with us to continue making waves in feminism, religions, and society. 2. Feminist Studies in Religion, Inc.
Feminist Studies in Religion, Inc. (FSR, Inc.) is a nonprofit organization whose goal is to foster feminist studies in religion in all of its variety and diversity. We understand “feminist studies in religion” to encompass global critical feminist work in religious studies, theology, thealogy, and spirituality both inside and outside the academy and at the grassroots level. We seek to generate new feminist scholarship in religion and to create spaces for such scholarship to emerge. Founded in 1983, FSR, Inc., pioneered the development of feminist studies in religion as a field through its establishment and sponsorship of the Journal of Feminist Studies in Religion. At the University of Auckland, New Zealand, the School of Theology offers opportunities to explore aspects within Christianity, one of the world’s major religions. Within the school, you will learn to explore questions of life and death, of belief and doubt, of hope and despair in a world which faces complex human and religious issues. The Center intends on “doing theology” through integrating Christian theology and ministry from feminist perspectives. We hope to raise voices of the marginalized, especially those of women, through participating in global and inter-religious dialogues. The Center’s intent is to grow as a community of those who hope to bring together voices from various corners and margins. The Circle’s mission is to undertake research and publish theological literature written by African women with special focus on religion and culture. The Circle is the space for women from Africa to do communal theology. Musa Dube, one of the Circle theologians, asserts that “… a circle of women describes those who are seated together, who are connected and who seek to keep the interconnectedness of life” (Dube 2001:11). The association of Women Scholars of Religion and Theology was founded in 1992 with a commitment to facilitating networks among women scholars of religion and theology with a view to supporting, encouraging, and promoting their work in the Asia/Pacific region and beyond. the development of a journal for the promotion of that work throughout the region and beyond. All three activities have sought to honor the goals of the association in its commitment to the promotion of women’s scholarship.